“It’s been there 100 years, very much the history of Hampton,” said onlooker Michael Cadarelli. It was chaos on Ocean Boulevard and Jake Fleming’s business, the Purple Urchin Café, was at the center of it. “You know, 21 years of my life and my wife’s life, it’s pretty tough,” Fleming said through tears. Firefighters are at the scene of a 3-alarm blaze in the Hampton Beach Casino Ballroom building in New Hampshire. He showed up to see smoke pouring out of his restaurant and firefighters battling to contain the flames. “We don’t know what happened as of yet,” Fleming said. Hampton Fire Chief Jameson Ayotte was the first to see the smoke. By 8 a.m. he called for three alarms and mutual aid came pouring in. Ayotte said the fire likely started in the roof and was contained to the café, but that there is smoke damage in the Casino Ballroom and throughout the building. Donnie Miller owns several seasonal businesses inside. 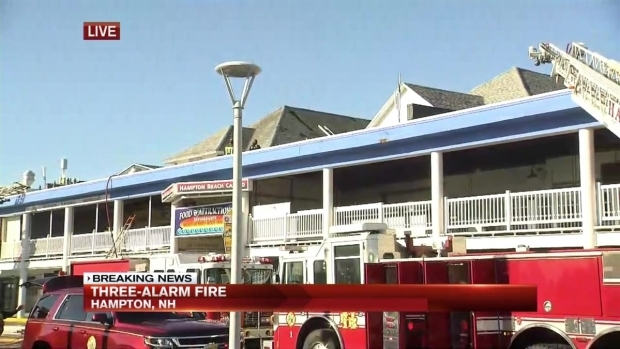 Firefighters were at the scene of a 3-alarm blaze in the Hampton Beach Casino Ballroom building in New Hampshire. 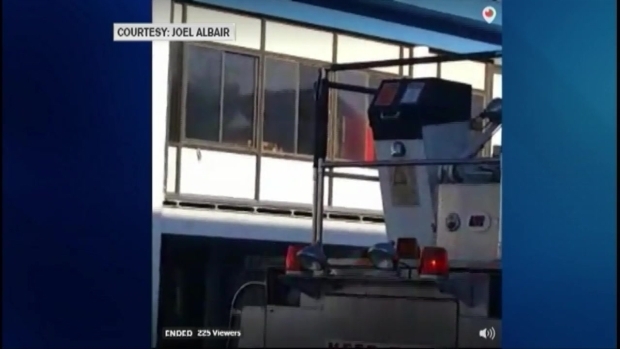 His livelihood though, is his graphic design company which lives on a hard drive, so firefighters allowed him inside to get it. “I never leave them in there, last night was the first night, it was very, very scary,” Miller said. People in Hampton say to own a seasonal business you’ve got be resilient and people like Jake Fleming are living proof. The state fire marshal will conduct a full investigation but Ayotte said at this point it does not appear suspicious. 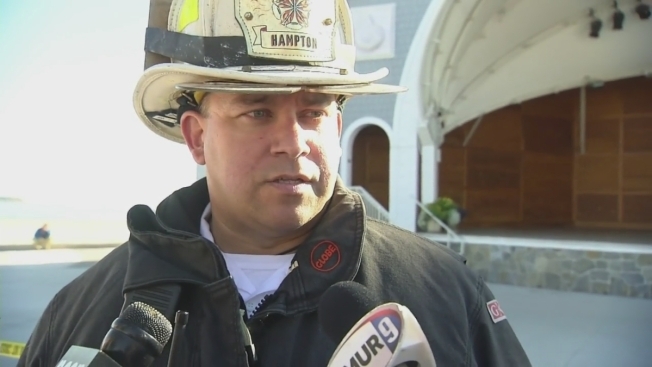 Two firefighters suffered minor injuries and are expected to be OK.
On Twitter, the Hampton Beach Casino Ballroom called the fire a close call, but added, "don't worry, we'll get everything fixed before #Summer2017!" Kathleen Madigan, a comedian who was scheduled to perform at the casino ballroom Thursday, sent out a tweet saying her show has been postponed. "28 yrs of standup, this hasnt happened," Madigan said. "They will fix n we will rebook. Sorry 2 everyone w tix and 2 the venue. :((("
It wasn't immediately clear if any other upcoming shows at the casino ballroom will be impacted.